Indianapolis: Jacob Barnett wants to be a genius when he grows up. 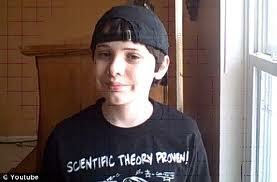 No wait, at 13 years of age he’s already a genius, and he’s setting out to disprove Einstein’s Theory of Relativity and the Big Bang Theory. At age nine, while playing with shapes, Jacob built a series of mathematical models that expanded Einstein’s field of relativity. A professor at Princeton reviewed his work and confirmed that it was groundbreaking and could someday result in a Nobel Prize. At age 10, Jacob was formally accepted to the University as a full-time college student and went straight into a paid research position in the field of condensed matter physics. For his original work in this field, Jacob set a record, becoming the world’s youngest astrophysics researcher. His paper was subsequently accepted for publication by Physical Review A, a scientific journal shared on sites such as NASA, the Smithsonian, and Harvard’s webpage. Jacob’s work aims to help improve the way light travels in technology. Well, we won’t get ahead of Jake. He’s only 13, so he’s got time to nail that problem and win the Nobel Prize. So what do brilliant prodigies want out of life? Not much, says Jake. He just wants to disproved the Big Bang Theory because it isn’t logical scientifically. When Jake is not solving the mathematical problems of the universe, his favorite pastime is playing basketball with the kids at his charity, Jacob’s Place. It is a place where kids with autism are inspired every day to be their true authentic selves…just like Jacob.